EDN published a short "Tales from the Cube" of mine. 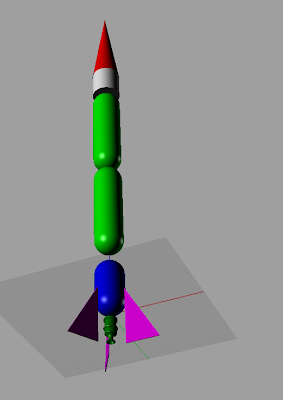 Its still going to be six months or more before I can really start working on this, but its my next notional rocket. It uses the motor valves and actuators from the Silver vehicle in a more aerodynamic shape. The Green tanks are Wellmate WM12 tanks with the air bladders removed, and the blue tank is the WM-6 that was the fuel tank on the silver. With a 16" diameter and 380 liters of light weight 500 PSI tankage it should go to 100K ft +. Its basically 20 ft tall. The tanks would be joined together with carbon fiber barrels bonded to the tanks. I've always wanted to watch a shuttle launch. I saw the very first shuttle land at Edwards, but I've never seen an orbital launch of any kind. After a little contact fishing I just received a VIP invite to watch STS-130. Thank you Will and Andrew! This is a night launch so it should be spectacular.